I kid you not, these names were chosen by the lesson for writing practice and not by me. 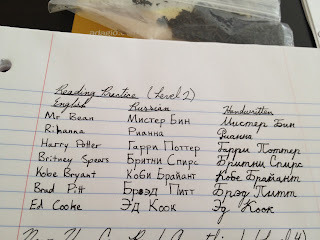 Yes, my Cyrillic cursive needs some work, and, yes, that is tea in the top of the photo. Upcoming sample reviews! A Review of The Lego Build-It Book, Vol. 1!